Spring is one of my favorite seasons, as it ushers in new life and warmer temperatures. I enjoy going out for walks to see the beautiful colors of Daffodils and Tulips, and to smell the lovely fragrances of the flowering trees like Dogwood, Cherry and Crabapple. What brings happiness to me, though, can spell misery to allergy sufferers as pollen counts rise and their symptoms kick into high gear. A couple of my co-workers are sneezing quite noisily and they have a constant supply of Kleenex on hand to help with runny eyes and noses. Just like humans, cats can have allergies to things they inhale from the air too. An allergy occurs when a cat’s immune system overacts to foreign substances or particles called allergens. Unlike humans, though, a cat that has inhalant allergies (also called atopy) will often have skin problems and severe itching rather than respiratory symptoms. It would seem logical that if a cat is allergic to something it inhales, the cat will have a runny nose. But, simplistically, an allergen causes the immune system to produce a protein called IgE. This protein attaches to mast cells located in the skin causing the release of various irritating chemicals such as histamine. In cats, these chemical reactions and cell types occur in highest amounts in the skin, so that’s where the symptoms appear. Inhalant allergies in cats usually start to develop between one and three years of age. Unfortunately, as cats age, they often develop allergies to additional things, and the response to any one allergen may become more severe. Allergens can be found in the indoor or outdoor environment, and they can be seasonal or non-seasonal. Common allergens include tree pollens (like flowering trees in the springtime! ), grass pollens, weed pollens, molds, mildew and house dust mites. The skin lesions of allergies are often the ones the cat produces by mutilating her skin through chewing, licking and scratching. Allergic cats often groom excessively and pull out tufts of hair, leaving bald patches on their skin. Their skin may appear red and sensitive, and lesions can range from small little bumps to crusty, scabby areas that bleed and ooze. Pet health issues like secondary bacterial and yeast infections are common. Diagnosis of inhalant allergies starts with a detailed medical history and a through exam. Tests may be performed to rule out other possible skin conditions such as flea allergy, contact dermatitis, ringworm and food allergy. Specific allergy testing is done either by taking a blood test or performing intradermal skin testing. The blood tests are reasonably reliable for detecting airborne allergies, but skin testing is considered more accurate. It involves shaving a patch of hair on the cat’s side and then injecting small amounts of allergens under the skin and observing to see if it elicits an allergic reaction. One of the most important treatments for inhalant allergies is to minimize the cat’s exposure to things he is allergic to. While it may be impossible to completely eliminate all of the offending allergens, many can be reduced with minimal effort on the owner’s part. 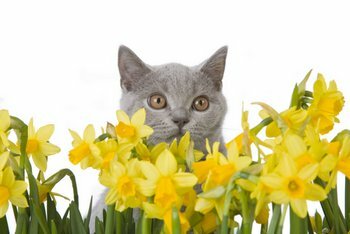 Simple measures include keeping allergic cats indoors with windows closed during periods of high pollen season, using air conditioners or air purifiers to help reduce allergens, and rinsing the cat off after periods in high grass and weeds. Other treatment options are chosen based on the severity of your cat’s allergy symptoms and the length of his allergy season. Mild allergy symptoms with only localized itching may sometimes be treated with topical shampoos or rinses, topical anti-itch solutions, antihistamines, omega-3 fatty acid supplements or a combination of these products. Always consult a veterinarian before giving your cat any human allergy medications. Corticosteroids are very good anti-itch and anti-inflammatory medications. Cats show many fewer side effects to steroids than dogs do, and they can be quite safe and effective in cats when used properly. There are many different kinds of steroids available in both injectable and tablet form. Newer medications include maropitant, which has anti-inflammatory effects, and cyclosporine, which is an immunosuppressant. Both of these drugs can be used to control allergies alone in some cases or in combination with steroids to reduce the dose of steroid needed. Antibiotics and antifungal medications are used to control secondary bacterial and yeast skin infections. Finally, severe allergies are sometimes treated with hyposensitisation therapy or “allergy shots”. Offending allergens are mixed together by a laboratory and very small injections given weekly at home over several months may help your cat to become less sensitive to them. Unfortunately, it can take up to one year to see the full effects. Inhalant allergies tend to be chronic conditions, so it is wise to have pet health insurance to help cover the financial burden of long term treatment. For more information about cat health or to learn more about pet insurance, visit Pets Best Insurance.